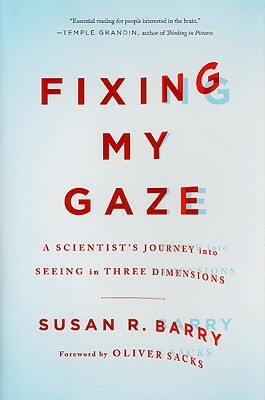 Susan R. Barry is a professor of neurobiology in the Department of Biological Sciences at Mount Holyoke College. She speaks regularly to scientists, eye doctors, and educators on the topic of neuronal plasticity. She has been featured on NPR and in a New Yorker article by renowned neurologist Oliver Sacks entitled "Stereo Sue." She and her husband have two grown children and live in South Hadley, Massachusetts. “Fixing My Gaze is a beautiful description and appreciation of two very distinct ways of seeing… But it is also an exploration of much more. Sue is at pains not only to present her story, in clear and lucid, often poetic, language, but also, as a scientist, to provide understanding and explanation. She is in a unique position to do this, drawing on both her personal experience and her background as a neurobiologist…. Though Sue originally thought her own case unique, she has since found a number of other people with strabismus and related problems who have unexpectedly achieved stereo vision through vision therapy. This is no easy accomplishment. It may require not only optical corrections (proper lenses or prisms, for example), but very intensive training and learning—in effect, learning how to align the eyes and to fuse their images, and unlearning the unconscious habit of suppressing vision which has been occurring perhaps for decades. In this way, vision therapy is directed at the whole person: it requires high motivation and self-awareness, and enormous perseverance, practice and determination, as does psychotherapy, for instance, or learning to play the piano. But it is also highly rewarding, as Sue brings out. And this ability to acquire new perceptual abilities later in life has great implications for anyone interested in neuroscience or rehabilitation, and, of course, for the millions of people who, like Sue, have been strabismic since infancy. “It had been widely thought that an adult, cross-eyed since infancy, could never acquire stereovision, but to everyone’s surprise Barry succeeded. In Fixing My Gaze, she describes how wonderful it was to have, step-by-step, this new 3-D world revealed to her. And as a neurobiologist she is able to discuss the science as an expert, in simple language."